Video clip synopsis – May O'Brien discusses growing up in a bush camp and her early years on a remote mission. Broadband MP4 obrien_bb.mp4 (13.7MB), suitable for iPods and computer downloads. May O’Brien is an excerpt from the program May O’Brien (26 mins), an episode of Australian Biography Series 11 (7×26 mins), produced in 2007. Aboriginal author and educator May O’Brien was born into the traditional life of the Wongatha people of Western Australia and educated on the remote Mount Margaret Mission. May became the first female Aboriginal teacher in Western Australia, fulfilling her dream and returning to the mission to teach. In this interview, May discusses growing up in a bush camp and her early years on a remote mission. There, May joined other displaced Aboriginal children, many of whom were removed from their families by force or under duress—these were the children of the ‘Stolen Generations’. While she was not ‘stolen’, May’s experiences in the institutions are very similar to those who were. 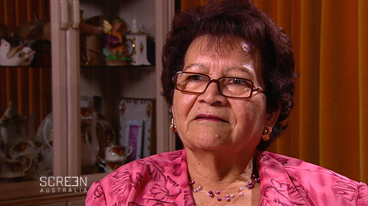 She grew up in a time and place where laws relating to Aboriginal people were particularly overprotective. The Native Administration Act of 1936 extended the Chief Protector’s powers in WA, giving him personal control over every area of life for an Aboriginal person: marriage, children, health, employment, education, residence and legal representation. Over 25 years, May fought for Aboriginal rights and helped create opportunities for her people, bridging the gap between cultures. May discusses her lifelong fight to get better education for Aboriginal children and more Aboriginal teachers, working in a male-dominated system and the joy of writing books which include her own language. * Note why May was always in trouble on the mission. * Note the offences and punishments. * Note the ‘freedoms’ enjoyed by the children. * Note why May was discouraged from forming a relationship at the mission. * Note the positive experiences in May’s life. * Note the problems May had at high school. * Note how May overcame these problems. * Note what May learnt from this experience. * Why were Aboriginal children brought up on missions? * What education was usually provided for Aboriginal children? * Write a report on ‘mission life’. * Explain the policy of raising and educating Aboriginal children on missions.